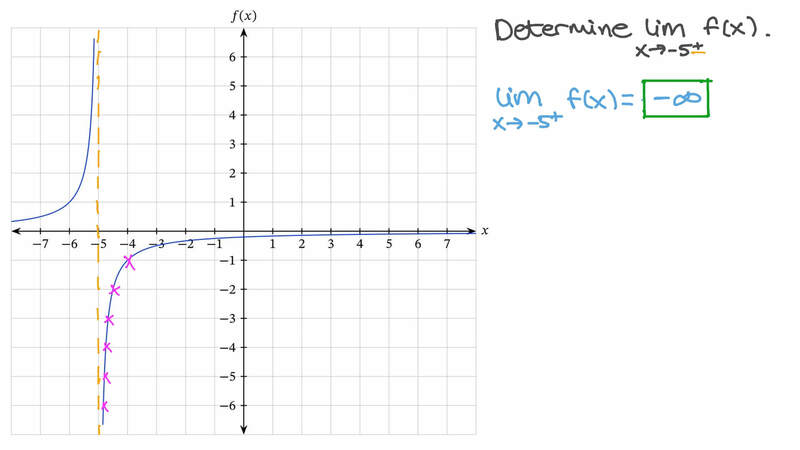 In this lesson, we will learn how to determine whether a limit tends to positive or negative infinity as x approaches a finite value. Determine l i m 𝑥 → − 5 + 𝑓 ( 𝑥 ) . Determine l i m 𝑥 → − 5 − 𝑓 ( 𝑥 ) . Determine the following infinite limit: l i m l n 𝑥 → 0 − 2 2  − 1 1 𝑥 + 9 𝑥  . Determine l i m 𝑥 → − 4 + 𝑓 ( 𝑥 ) .